To create a new competition from the competition landing page select the add competition button and select whether to create a new competition or to create one from an existing template. Default Venue: This is the primary venue for your competition selected from your list of locations. However fixtures can be run across multiple locations. Competition Start Date: Date the competition begins, until this date is reached it will only be visible in the ‘Coming Soon’ section on the front end site. Competition End Date: Date the competition ends, once this date is reached it will be hidden from the front end site. Recurrence Type: Select the frequency of the events (same day, daily, weekly, monthly). When the fixtures are generated this will be used as the interval between a team’s matches. Games per Block (optional): The number of simultaneous games. If this is left blank all games will be played at the same time. Setting this to ‘1’ would mean that one game would be played after the other. This is helpful when there aren’t enough pitches available for everyone to play at the same time. Registration start & end date (optional): This date range sets the time that a user can register onto the competition through the front end site. If left blank then it’s not available for online signup. Max Entrants: The maximum number of entrants allowed to join the competition from the front end site. Max Teams per division: The maximum number of entrants per division. When auto generating divisions it will automatically add this amount to each division. Play each other: The number of times two teams play each other. In this section you are able to select all venues that are available for the type of sport you selected. When fixtures are generated they will loop through each venue selected for each match. If there are four games per fixture block and four venues are selected then each game will be on a different venue. Alternatively if there are four games per fixture block and eight venues are selected then each game will be on one of the first four venues and the extra four will not be used. If you do not have enough pitches available then you must use the ‘Games per block’ feature mentioned above. Pay Registration Fee & Deposit in Advance: If this is activated then teams are required to pay their registration fee and deposit upon joining a competition. If the payment gateway module is added then users will be redirected to the payment gateway to make the payment before they are added to a competition. Select the season the competition is in. Or alternatively create a new one. Set the number of teams who will be automatically promoted and demoted when the next season starts. Only applicable if a follow on tournament is selected. 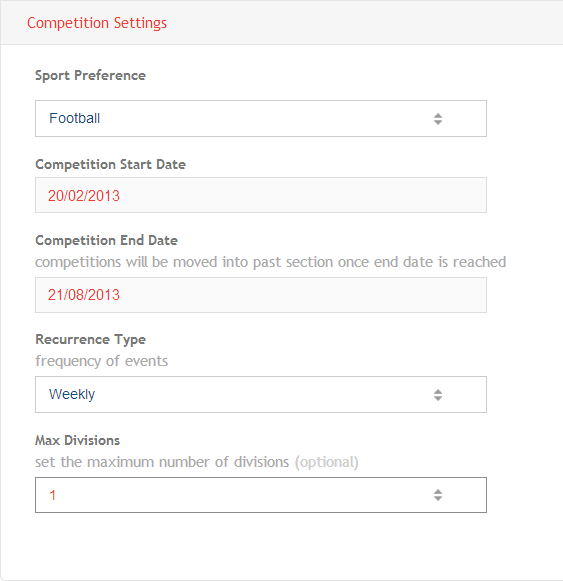 Allows the user to create a tournament selecting entrants from pre-existing leagues. By default entrants will be taken from the top of the table e.g. taking four entrants from a division will take the top four entrants when the competition finishes. You can also skip entrants, this is helpful when creating playoffs for losing teams. E.g. if you would like to select the last four entrants from a division of eight then you would set the ‘Skip’ field to four and the ‘Take’ field to four.